Earlier this weekend, I sat down with Class A Lakewood manager Greg Legg, who has been in the Phillies organization for the past 33 years, after being drafted by the club in 1982. 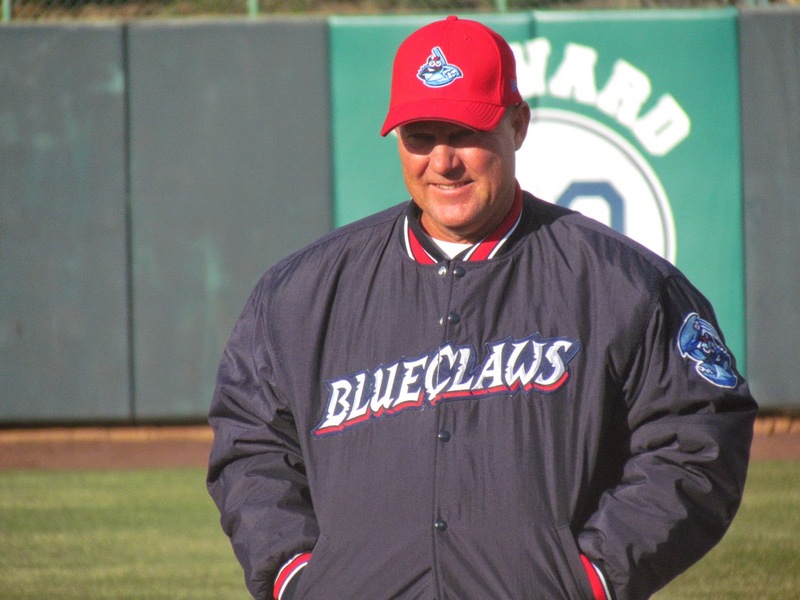 He managed the BlueClaws in their inaugural season in 2001, managed Double-A Reading from 2002 to 2004, was the skipper for Class A Advanced Clearwater from 2005 through 2006 and managed short-season Class A Williamsport in 2007. He then acted as hitting coach in Lakewood from 2008 through 2013. The former infielder played in the big leagues for just a handful of games in 1986 and 1987. He now grooms the Phillies' stars of the future. Greg spoke with me about the roles of some of his players including Gabriel Lino, Carlos Tocci, Samuel Hiciano and Willians Astudillo, the BlueClaws' start to the new season, his own goals for this year plus plenty more. Read ahead for his thoughts. -The team started the season on the road before having its opening home stand this weekend. What were your thoughts on how the team opened the season, winning two of six contests? For what happened on the road, we played pretty good baseball. We could have won five of the six. J.P. (Crawford) missed two games. He could have been the difference in at least one of them. But, I thought we played pretty good ball on the road trip. -The BlueClaws have just a small amount of returning names this year. What can you tell me about how you expect those guys to help the team this year? Well, (Carlos) Tocci was so young last year, he almost had to come back here this year and he should patrol center field for us pretty good and get the job done out there. And we're hoping he's a little stronger, he's a bit heavier- six or seven pounds heavier- so far, he's swung the bat really good. He hasn't gotten much results for it, but he's driven some balls better than last season. I look for him to have a pretty good year. Larry Greene got out of the gate slow last year, joined us (late) and didn't have the year that he wanted and he's back here repeating and, hopefully, this year he'll have a nice season for us. -How will the playing duties be distributed among the catchers on the roster? Well, (Gabriel) Lino's our number one catcher for right now and he's done a great job for us. He had a great spring. (Willians) Astudillo's our first baseman-slash-third baseman-slash-DH-slash-catcher. He creates a lot of energy for us, with his enthusiasm for the game and his ability to put the ball in play and be a threat with the bat. -Any details on the roles for any other offensive players? (Samuel) Hiciano is our fourth outfielder and DH. He can play all three positions and he can do a little bit of everything. He throws well, runs well, shows a little bit of pop in his bat, so he's a pretty complete player. He's just got to get some at bats and grow as a player. -Can you share some thoughts on Mark Leiter Jr., who has performed strongly for you guys? Yeah, he pitched great last year and the two games he pitched on the road trip really rested our bullpen and gave us a shot in the arm. He could be 2-0 real easy. -How about that bullpen...are there any defined roles for a lot of those guys? No, I don't think you can, down here in the Sally League. At least not at the beginning. If we get a chance to be a playoff type team, maybe at the end, we'll do a little more of that, but for right now, we're going to try to get some guys a couple innings here and there and let it play itself out, see who the guys are. Maybe give them all a chance to close and find out who the right guy is. -Last thing...your role. You're new to the role, but not new to the role. Just talk about that a bit and what is your outlook for the year? Well, I'm here to try teach them as much as I can about playing pro ball, but a lot of them are new to it, it's their first full year. Some of them have a little more experience, (they know) what to expect, how to handle it the correct way. I'm supposed to be there for them, but, hopefully, I start the season with these 25 guys and end the season with 25 different guys. That's kind of my goal.